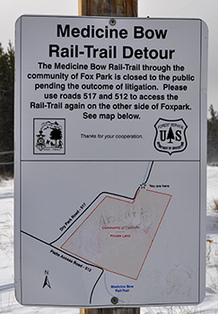 FOX PARK, Wyo. -- Floor-to-ceiling windows in Marvin Brandt's two-story cabin offer a panoramic view of the snowy, wind-swept Medicine Bow forest. The scene reminds Brandt of his father's sawmill that once produced rail ties for the Union Pacific Railroad. The mill is long gone, and -- to Brandt's eye -- his view is ruined by a Forest Service bicycle trail that runs behind his property, then bisects his 83-acre tract, which is about 50 miles west of Laramie. Brandt, 69, has protested the trail since the Forest Service proposed converting the abandoned railway for recreational use nearly a decade ago. He claims that once the railroad abandoned the government-issued right of way in the mid-1990s, he gained ownership of that land. "We traded for the land with a right of way on it for railroad uses," Brandt said. "They want to bring a train through here, that's fine. We never expected and we never agreed to a bicycle trail." 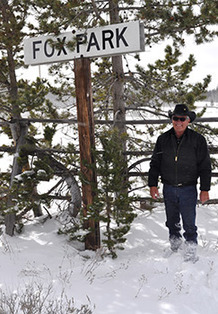 Marvin Brandt standing at the former railroad stop in Fox Park, Wyo. Brandt says the Forest Service unlawfully built a bicycle trail on the abandoned railroad right of way that crosses his land. All photos by Jeremy P. Jacobs. In January, Brandt will take his fight to the Supreme Court in a case with broad implications for property rights. The West has thousands of miles of abandoned rail rights of way that were granted under the 1875 General Railroad Right of Way Act, experts say. Already, the government is facing thousands of lawsuits in which landowners claim that trail construction on former rights of way amounts to unconstitutional takings without compensation. "This is definitely a takings case," said Danaya Wright, a property rights professor at the University of Florida Levin College of Law. "It's motivated by takings issues." Brandt's effort has caught the eye of property rights and libertarian groups, such as the Cato Institute. A victory could make it much easier for landowners to win in court, putting the government on the hook for potentially millions of dollars. That may explain why the Obama administration took the unusual step of asking the Supreme Court to review the case, even though it defeated Brandt in lower court. It's looking for a Supreme Court precedent to head off the takings claims. The government contends it retained ownership of the 200-foot-wide strip, citing the 1875 law and a "reversionary interest" in the land after the rail ties were pulled up. But Andrea Ferster of the Rails-to-Trails Conservancy in Washington, D.C., maintains the government strategy is risky. If Brandt wins, she said, the government will become even more vulnerable. "It would open up previously converted 1875 act corridors to legal challenges," Ferster said. "That would be a huge change. There would be a lot of litigation." Brandt is partial to black Western shirts, a black cowboy hat and black, thick-rimmed glasses. His leathery face is what you'd expect on someone who has spent his life outdoors in the harsh winds of Wyoming. He has a penchant for Swisher Sweets, cheap cigarillos. He speaks of the Medicine Bow forest with reverence and gladly recounts his family history. His father, Melvin, came to the area from Oklahoma in 1939 to make railroad ties. The Forest Service soon asked Melvin to set up a sawmill on the site and provide permanent, year-round jobs. Melvin agreed, and eventually the Fox Park Industrial Site grew to about 30 small cabins, several of which Melvin built himself. In 1946, the Brandts officially bought the sawmill while they were raising Marvin in an 8-by-12-foot cabin not far from his current house. Business was good for the family, and they eventually acquired several pieces of land scattered throughout the forest. In 1976, they agreed to a land exchange with the Forest Service, giving up about 220 acres for the 83 acres Brandt now owns. Around the same time, Brandt says, local groups such as Cycle Wyoming approached the Forest Service about building a trail. They proposed converting part of a 66-mile right of way that was once used by the Laramie, Hahn's Peak and Pacific Railroad Co. to transport gold, coal and lumber from Laramie to the Colorado state line. A Forest Service sign outlines Brandt’s property and informs bicyclists that the challenged section of the trail is off limits pending Brandt's case, creating some animosity among local cyclists. The railroad stopped running in 1995 and was formally abandoned in 2004. In 2005, the Forest Service proposed the bicycle trail's route, which bisected Brandt's property where the railroad formerly ran. Brandt claims the Forest Service "kept it a secret" from him. Later that year, in a February 2005 letter, the service apologized for not putting Brandt on its "distribution list." "It was an oversight on our part," it wrote in a letter shared by Brandt. In the middle of 2006, the Forest Service asked a federal court to declare its ownership of the right of way, citing a reversionary interest in the 1875 law. The service won, and Brandt appealed to the Denver-based 10th U.S. Circuit Court of Appeals. That panel again sided with the service, saying the government still has a right to the land and citing a circuit precedent on the reversionary interest issue. Brandt and his lawyers say the court is wrong and point to the 1976 land exchange. In that document, they contend, the Forest Service was required to lay out the terms of Brandt's ownership of the property. It says nothing of a reversionary interest in the right of way, except for a railroad, which was still operating at the time of the exchange. "Marvin has a document where this land was conveyed. Under the terms of that conveyance, there is no indication that the United States government is reserving the land," said William Perry Pendley of the Mountain States Legal Foundation, which is representing Brandt. "The Forest Service for the first time is taking the position that they retain an interest when [the railway] goes away, and that they can use it for any purpose they want." But as with most Supreme Court cases, it's not that simple. Congress and courts have long grappled with property rights issues dealing with abandoned rail rights of way, and more times than not they've disagreed, creating a mess. The Supreme Court, for example, hasn't defined a reversionary interest or explicitly said whether one exists. In 1903, the court held in Northern Pacific Railway Co. v. Townsend that a rail right of way issued under an 1864 statute constituted a "limited fee" interest, meaning the railroad completely owned the land until it stopped using it. At that point, the right of way reverted back to the United States. That would seem to back the Forest Service's argument. But in 1942, the court took another look and saw the issue differently. In Great Northern Railway Co. v. United States, the court considered whether rail companies own mineral rights under a federally issued right of way. The justices ruled the companies did not own those subsurface rights and, in so doing, characterized the rights of way as easements. That implied the government had no ownership stake in the land and merely granted the rail companies the right to pass over private property. That ruling would support Brandt's argument. Underlying all this, however, is a shift in Congress from giving away Western land. Congress passed the Railroad Right-of-Way Abandonment Act in 1922, which included a section that transferred ownership of an abandoned right of way to its underlying landowner if the government didn't turn it into a highway. More than 60 years later, in 1988, Congress amended that provision to say the government may still turn an abandoned right of way into a highway. But if it doesn't within a year, the United States retains the land. Wright, the University of Florida law professor, said Congress clearly intended to retain ownership of the land. "It was federal land to begin with," she said. "This idea that the private landowners should somehow have a claim and get compensation because the government continues to exercise dominion over land that they owned all along makes no sense from a public policy perspective. These were public lands developed with public money and should remain public assets." The confusion has led to conflicting interpretations in various federal appellate courts. In 1994, the 10th Circuit, which handled Brandt's case, held in Marshall v. Chicago and Northwestern Transportation Co. that the government has a right to the land under an abandoned right of way, citing congressional intent and a lengthy list of previous railway cases in the 10th Circuit. Fast-forward to 2005, and the U.S. Court of Appeals for the Federal Circuit ruled in Hash v. United States that no such government ownership exists. The court held that the government gave land away to about 200 Idaho homesteaders before the rights of way were issued. After the rights of way were abandoned, the land returned to the original property owners, the court held. "We have been directed to no suggestion, in any land patent, deed, statute, regulation, or legislative history, that can reasonably be construed to mean that the United States silently retained the fee to the land traversed by the right-of-way, when the United States granted that land to homesteaders," Judge Pauline Newman wrote. Six years later, the Chicago-based 7th U.S. Circuit Court of Appeals agreed with the Hash holding on the reversionary interest issue in a decision penned by Judge Richard Posner, one of the country's most influential conservative judges. The Hash decision is particularly important because the Federal Circuit has jurisdiction over lawsuits in which landowners claim their property was unconstitutionally taken by the government without just compensation. So if the circuit adheres to that precedent, the government stands to lose all takings cases involving rail rights of way that make it to the federal appellate level. The Forest Service would not comment on the litigation, but in court documents, the government indicates the Hash decision is why it asked the Supreme Court to take Brandt's case. "To date, thousands of claims pertaining to the 1875 Act rights-of-way have been filed," the government wrote. "Under current Federal Circuit precedent, the United States will be obligated to pay just compensation on many claims in which ownership of the right-of-way is often a determining factor. Those claims could impose a considerable financial liability on the United States." Wright put it another way: "What the government is trying to do is get rid of the Hash decision." None of that seems to matter to Brandt, though. He says he just wants his property kept intact and faults the Forest Service for building a trail that he claims almost no one uses. The Forest Service has marked the trail on land that Brandt contends he owns. The trail extends behind the sign. The part of the trail that goes through his property is currently closed due to his litigation. But on the section visible from his house, he says he's seen "maybe 50 or 60" bicyclists since the path opened in 2007. In its environmental assessment of the trail, the Forest Service projected about 120,000 cyclists would visit the trail annually. 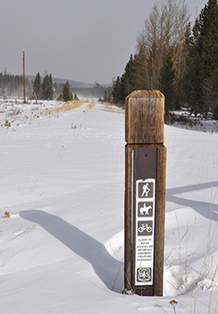 Even Amber Travsky of Cycle Wyoming, who was instrumental in establishing the trail, said she doesn't ride it often because it's fallen into disrepair as the Forest Service has focused its time and money on the forest's pine beetle infestation. "It's floundering now," said Travsky, a wildlife biologist. "It's not a whole lot of use. The quality really needs upgrading." In the meantime, Brandt continues to plow roads in Fox Park with his tractor. Since the sawmill shut down, it's no longer bustling. Fewer than 10 of the 30 cabins are occupied year-round. But Brandt still calls it a "nice community" and a "getaway." Asked whether he is the de facto mayor of Fox Park, he responds, "Well, I've been called a lot of things. I guess you could call me that."